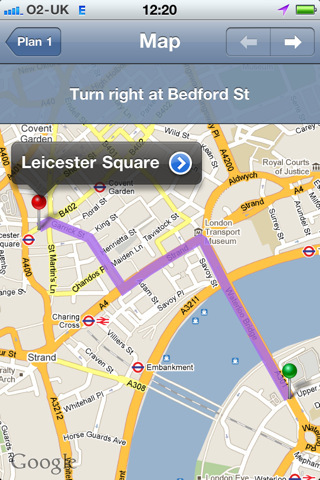 The London Transport iPhone app is a simply yet effective app that pulls live transport data and helps you get from A to B. If you’ve ever tried to navigate London’s arcane and labyrinthine transport system you’ll appreciate why there are so many apps aimed at giving you a helping hand. It’s all a bit of a mess, with a fantastic but scattered network of tubes, trains, buses, bicycles and boats. It’s also very unreliable. On certain weekends half the network shuts down. Literally. On Christmas day they simply give up and don’t bother with service at all. There’s a saying about Italian dictator Benito Mussolini that for all his ills “at least he made the trains run on time.” Spend a little bit of time trying to get around London and you’ll appreciate why that is such a big deal. Fire the London Transport app up and you are presented with a simple selection of choices that eschews eye-candy in favour of simple and to the point user choices. The first three bookmarks highlight this simplicity: Plan a journey; Take me home; and Book a nearby minicab. Plan a journey is fairly self-explanatory and you simply input your “from” and “to” locations and select your “by” of choice. You can also modify your Mobility preferences, enabling you to avoid too much walking or stairs if that presents a problem for you. The app will then present you with a range of journey options and departure times. Recently planned journeys can be viewed without an internet connection. Take me home is handy function if you are lost, or have simply partied a little too hard and ended up on the other side of town. You store your home location and then pressing the button will tell you the best way to get back their using location-aware technology. Likewise the Book a Minicab function will bring up the closest cab company and their phone number – but will also provide alternatives if they attempt to fleece you. 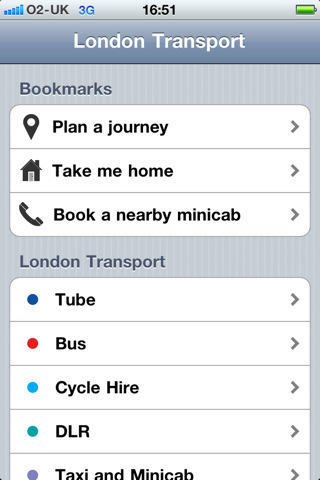 Beyond the bookmarks the app lists all the transport options you have – Tube, Bus, Bike etc and gives you information about all of them. You can see the status of Tube lines (which is a lifesaver on weekends), a map of the underground, and a live list of departure times. You can also see bus routes near you, where Borris bikes for hire are located, if there are any parking spaces and how many bikes are located at the stations. You can also see where the nearest top-up locations for your Oyster card is or what you balance is. Much as I love this city, getting around to actually see things in it is a pain and the London Transport app takes a little bit of the sting out. And for 59p it’s a great bargain. AppSafari review of London Transport was written by Shem Pennant on April 13th, 2011 and categorized under App Store, GPS, Local, Travel, UK. Page viewed 5040 times, 1 so far today. Need help on using these apps? Please read the Help Page.